SAVE $$$ and Support the Trainers’ Trust at the same time! The ATA and United Petroleum (UP) have teamed up to provide ATA Members and their staff with the opportunity to save $$$ on their purchase of fuel at participating UP outlets. With an initial trial in Victoria before expansion of this program interstate, the UP COMMUNITY DISCOUNT FUEL CARD will provide a 2c per litre discount on the price of petrol and diesel* at the pump, with a further 2c from every purchase directed to the Australian Trainers’ Trust. It only takes 60 seconds to complete the application online and submit. The UP COMMUNITY DISCOUNT FUEL CARD will arrive by post within ten (10) working days. The card is pre-registered, so you can immediately use it upon receipt. This program is EXCLUSIVE to ATA Members. As an added benefit, membership of the program also extends to ALL staff employed by the ATA Member. So sign up today, and start saving $$$ on your fuel purchases while supporting our cause. * Discount available on diesel and petrol only. Excludes LPG. Established over 35 years ago, and operating as United Petroleum for the last 25 years, UP is a 100% owned Australian company. UP has more than 400 retail service stations nationally, with some 120 throughout Victoria. UP is recognised as Australia's market leading “Fuel Discounter”, offering customers the lowest prices wherever they trade. United Petroleum - ‘The New Name in Racing’. 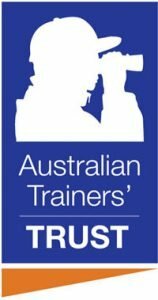 The Australian Trainers' Trust was established in 2015. It is the only Trust of its kind that operates nationally to support Trainers and their families financially, where the Trainer suffers serious and debilitating injury, illness or death.